Posted on 21, July 2016 by EuropaWire PR Editors | This entry was posted in Automotive, Environment, Germany, Technology, Transportation & Logistics and tagged "Most efficient electric vehicle", Electric car, Guinness World Records, Lisa Kugler, Technical University of Munich, TUfast Eco Team. Bookmark the permalink. MUNICH, 21-Jul-2016 — /EuropaWire/ — Successful world record attempt: Last Saturday, the electric car designated the “eLi14”, designed and built by the TUfast Eco Team, proved that it is the most economical electric car on the planet. And as a result is now listed as the “Most efficient electric vehicle” by Guinness World Records. The TUfast Eco Team is part of the student group known as TUfast at the Technical University of Munich (TUM). Every year it builds a new electric vehicle with the aim of participating in energy efficiency competitions. The new members of the team who designed the “eLi14” vehicle in 2014 pursued an even more ambitious goal. “We were convinced that our vehicle had a lot of potential,” explains team leader Lisa Kugler. The team therefore set its sights on the world record for the most economical electric vehicle. 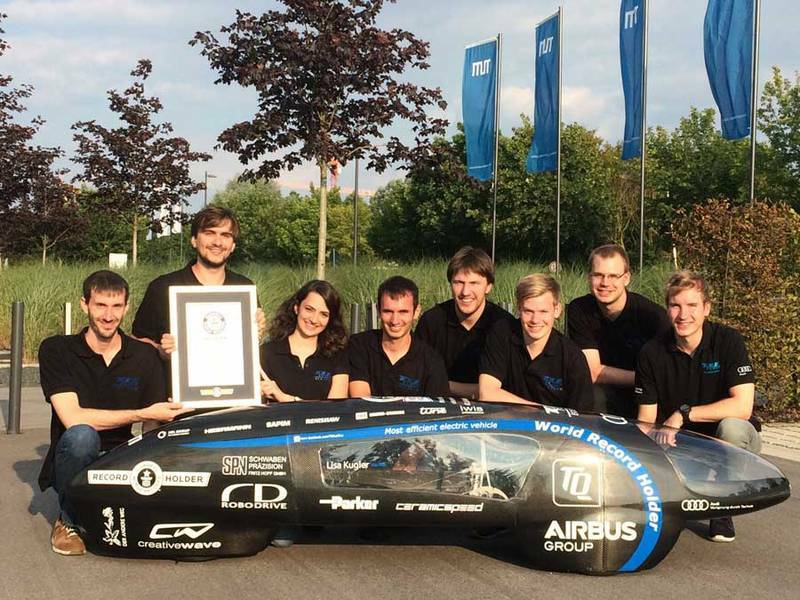 A test track in Bavaria gave the team – comprising eight graduates and one student from TUM – the chance to show what its car was capable of: over a distance of 25 kilometers, it used up just 78.79 kilojoules. When converted, this means 1232.2 kilometers per kilowatt hour or alternatively a distance of 11,000 kilometers with one liter of gasoline. This meant that the team had managed to setthe efficiency record. An inspector from the Guinness World Records confirmed the world record in the category “Most efficient electric vehicle” at their location. The young designers had worked on their vehicle for over a year in preparation for the world record attempt. They reduced the overall weight to around 20 kilograms. The vehicle was also optimized aerodynamically to cause as little friction as possible.